Two out of five low-paid young parents who ask for flexible work arrangements are “penalised” as a result, according to a TUC survey. They are given fewer hours, worse shifts and some have lost their jobs, its survey of 1,000 parents suggested. About half of low-paid young mums and dads are struggling to manage work and childcare, the trades union body said. A government spokesperson said businesses must have a legitimate reason to refuse flexible working. The TUC survey found that more than half of those working in low-paid sectors, such as retail, hospitality and social care, did not know their employment rights, with many unaware of unpaid parental leave arrangements. 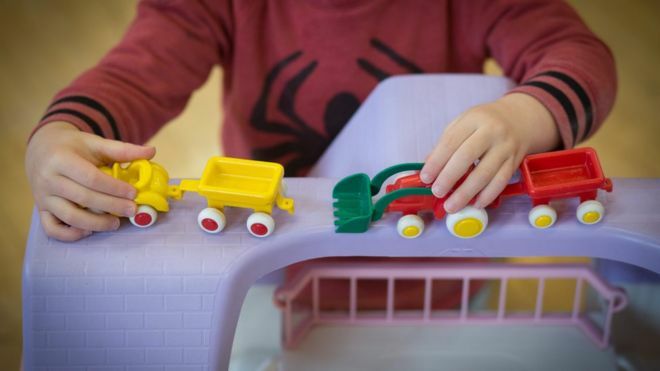 All the young parents the TUC spoke to had at least one child aged between 1 and 16, were themselves aged between 20 and 35, had household earnings of less than £28,000, and none found it very easy to organise childcare with their working hours. TUC general secretary Frances O’Grady said: “Too many workplaces expect mums and dads to forget all about their kids as soon as they walk through the door. Ms O’Grady said: “It’s a nightmare to plan childcare when your boss changes your shifts at the drop of a hat, and you never work the same weekly hours twice. She said it was “shocking” that some mums and dads were stopped from taking their children to hospital when they were sick. She added that workers should be told their shift pattern at least one month in advance. Ben Willmott, head of public policy at HR professional body the CIPD, told the BBC that employers can be more innovative about flexible working. “Certainly employers can do more about communicating the rights that people do have for time off to care for dependents,” he said. Ben Wilson, executive director at the Equality and Human Rights Commission, called for a radical overhaul of company cultures to make flexible working the norm. A spokesperson for the Department of Business, Energy and Industrial Strategy said that more than 20 million people in the UK were eligible to request flexible working, and businesses must have a legitimate reason to refuse a request. “We commissioned Matthew Taylor to review modern working practices to ensure our employment rules and rights keep up to date to reflect new ways of working. “We are considering his report carefully and will respond in due course,” the spokesperson added.